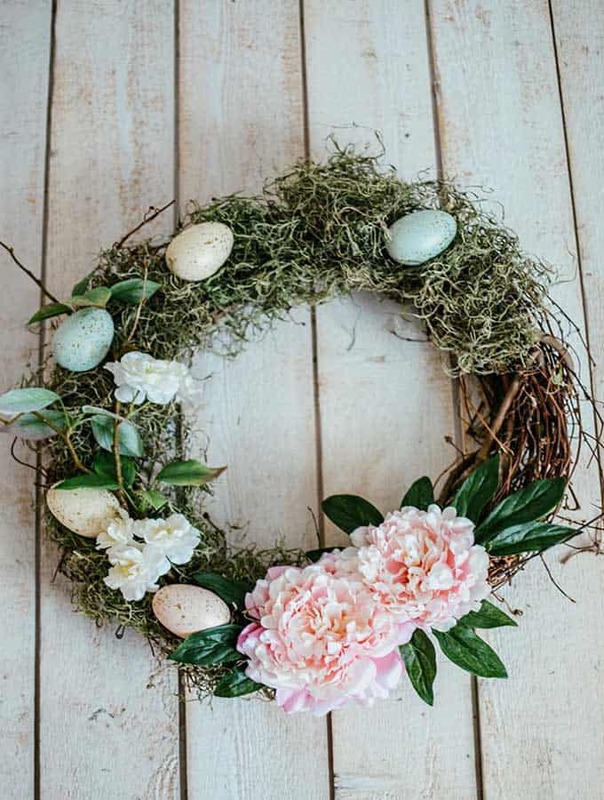 Easter crafts with vintage flowers are a unique way to decorate for Spring! 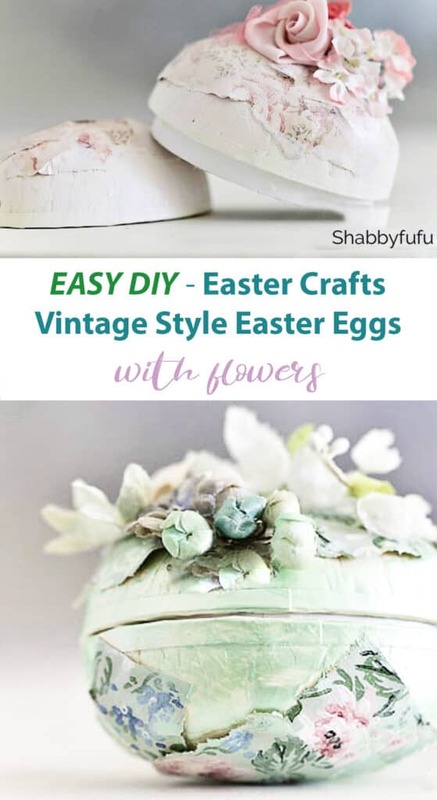 In this post you’ll learn how to make Easter egg boxes with vintage millinery and paper. 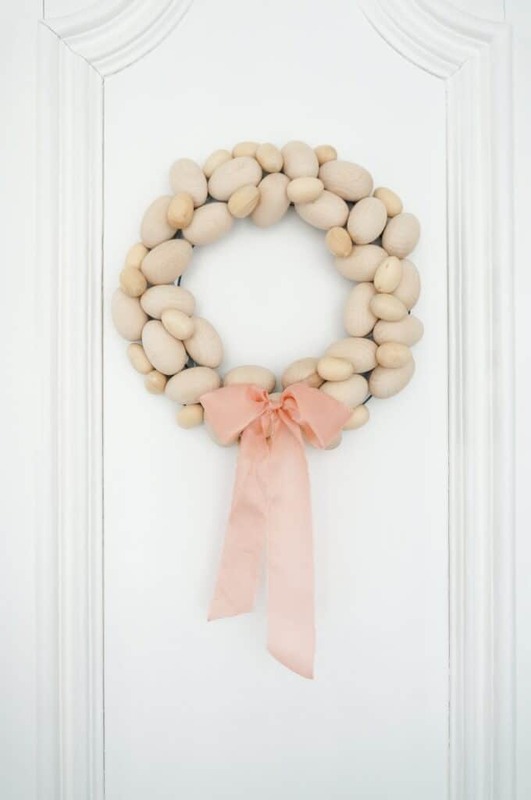 Vintage Easter decorations are something that I’ve always loved. Not a surprise since I tend to gravitate towards objects with patina and a past. 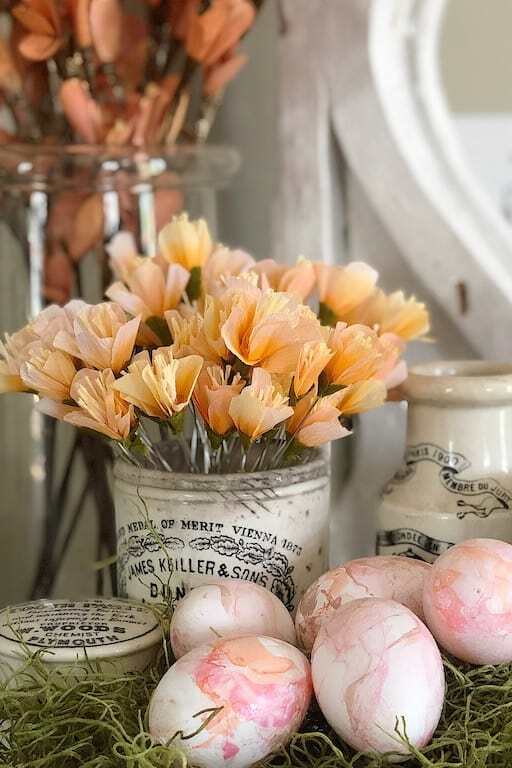 These vintage style Easter eggs are perfect to display spring or to give as gifts filled with candy. The photo below is from a published magazine piece from several years back, with an idea of how to artfully display! This previously written post from 2014 has been updated. Today I’m sharing a mini tutorial on how to make these sweet millinery eggs. Egg caches were first made popular in the late 19th century in Germany. They were hand-crafted out of paper mache and used to hold Easter candy treats. 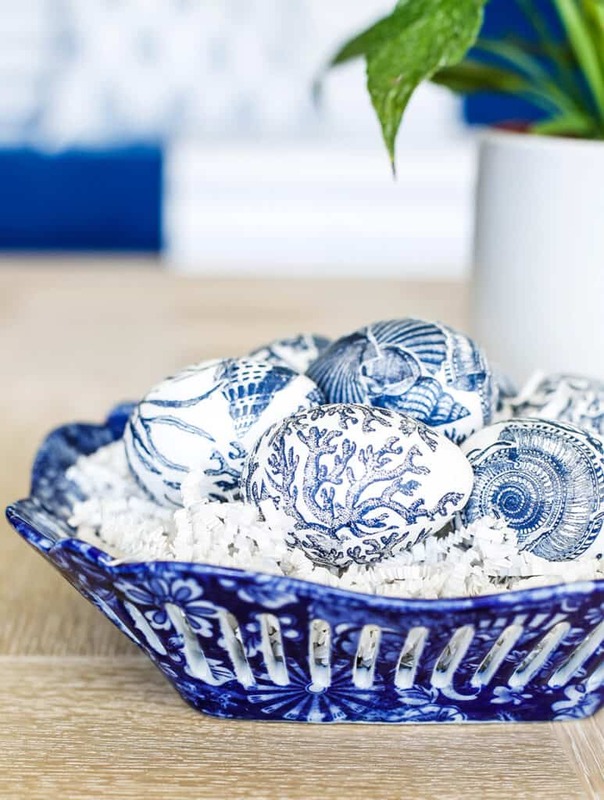 Surprisingly you can still find some of the antique German Easter eggs that are beautifully decorated. Many did not last since they were giving to children, but HERE is often a good source. 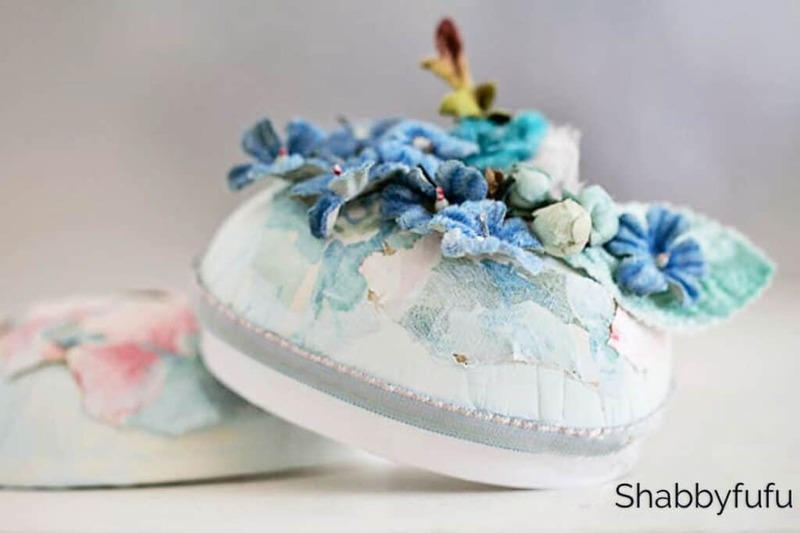 I made my own version in true Shabbyfufu style and sold them for spring in the shop for a number of years! I no longer run my on-line shop, so if you’d like to try your hand they make for gorgeous gifts for friends! They are easy to make and customize and you can find cardboard egg boxes HERE or at your local craft store. I start out by painting them with acrylic craft paint and on these I used iridescent pastels mixed with a bit of gesso for better coverage. 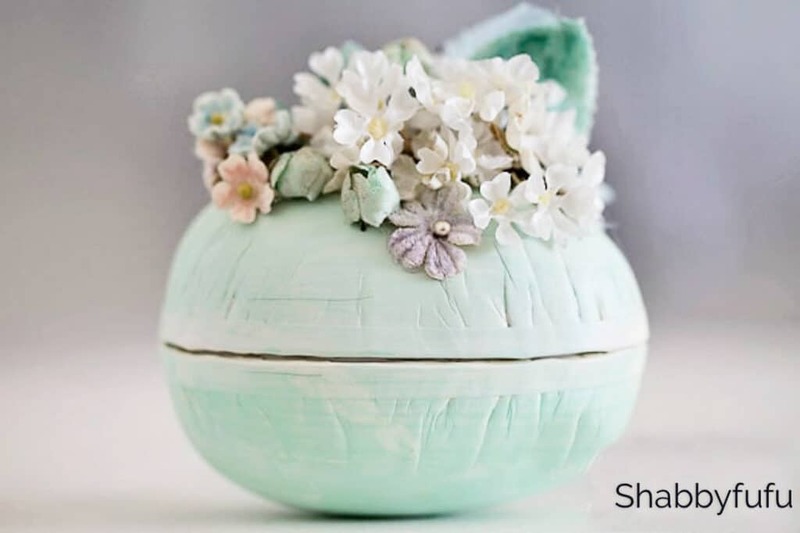 As a former art teacher I am big on BUDGET craft ideas and talked about paint saving techniques in THIS POST (a must read for crafters!). I love the iridescent paints but you definitely could use any paint that you have on hand. 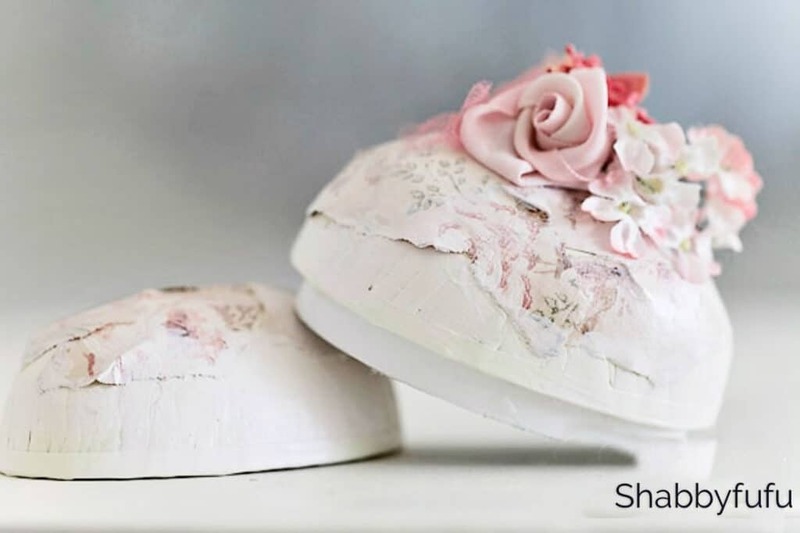 Let the paint dry thoroughly overnight before adding any embellishments. Once the paint is dry, the fun begins! I love the look of torn paper and used some scraps of vintage wallpaper on some of the egg boxes. 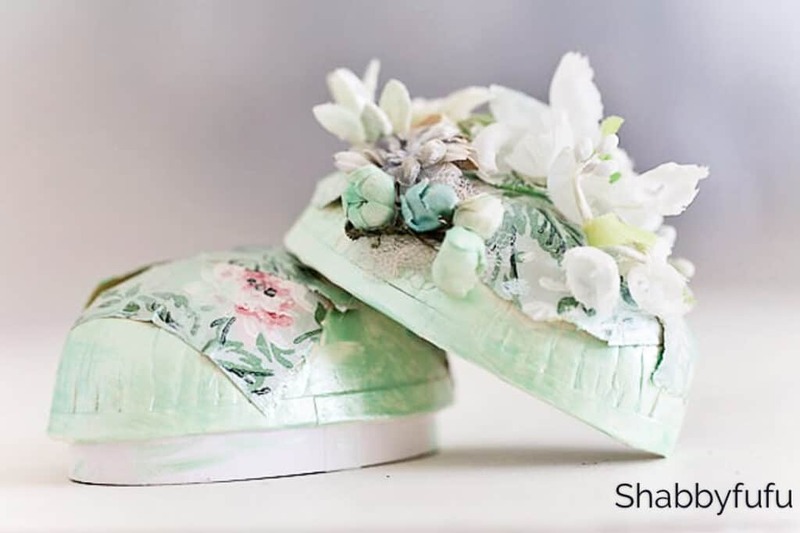 Use either Mod Podge or regular white school glue (money saver!) to adhere the paper to the egg. There are no rules, just play with the paper and use small snippets or larger pieces. Once dry, coat the top with a layer of Mod Podge to protect it. 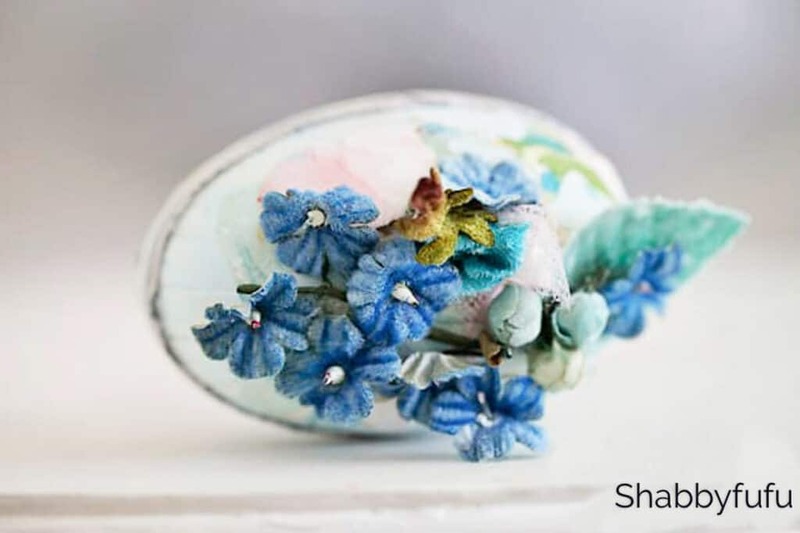 You can also use pastel colored tissue paper or floral paper napkins if you have either of those in your stash. I have given the paper an aged look by applying a couple of coats of the flat finish Mod Podge that dulls the color of the wallpaper. Next add some vintage millinery or new mini silk flowers. Here are some mini silk ranunculus that I LOVE! 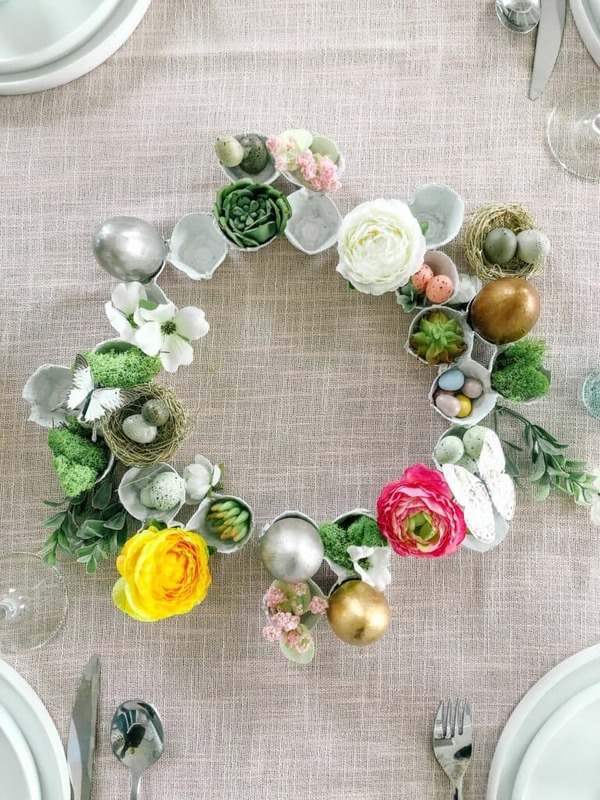 It’s really a personal choice in how to decorate something like this. On this egg I used antique French millinery ribbon to cover the seam. Totally optional, so take it as far as you’d like to go! 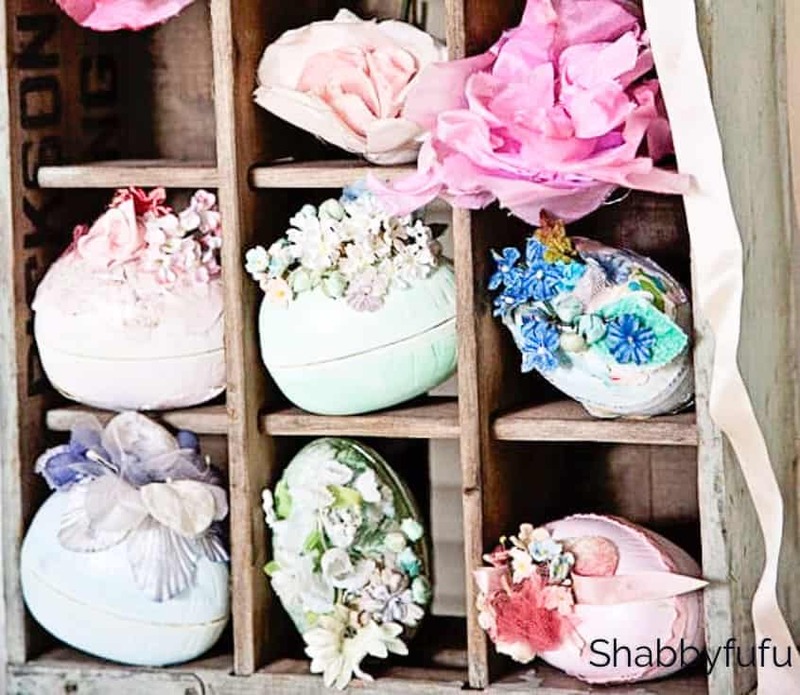 Lots of pretty vintage millinery embellishes all of the eggs and makes each one unique. As mentioned, if you don’t have any old millinery you can use new. 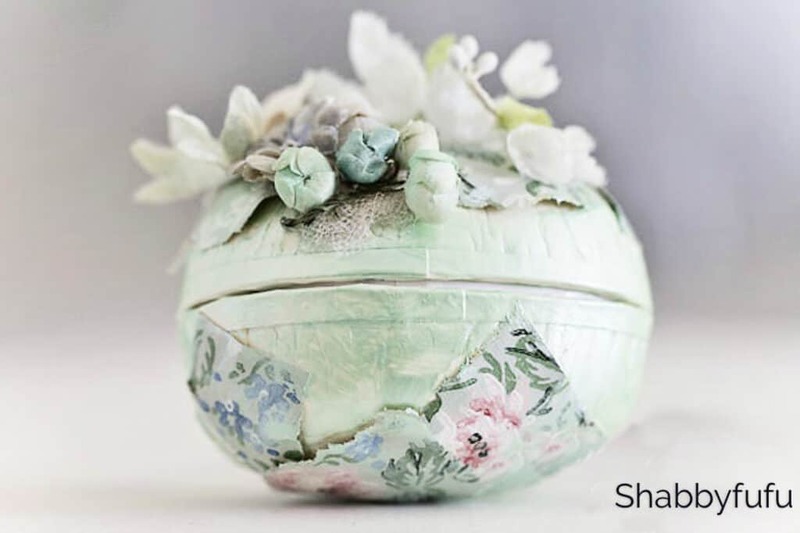 Remember to keep scale in mind when working with small objects like a vintage easter egg box. 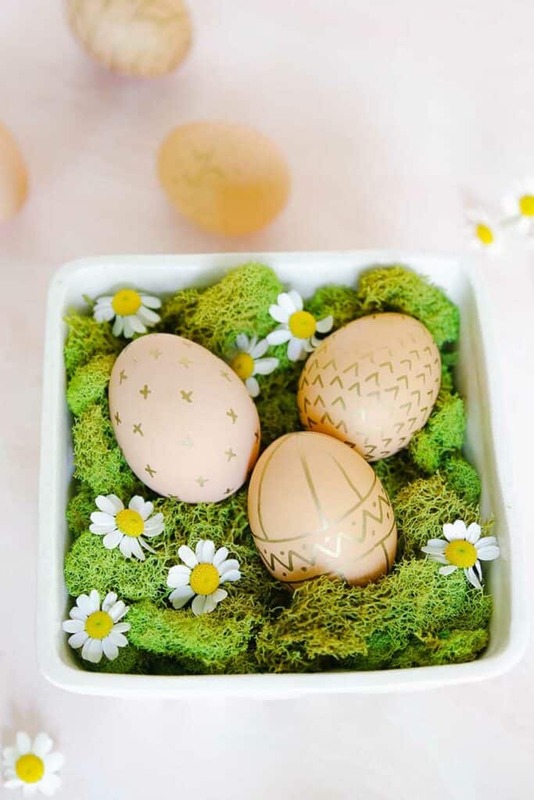 Fill with candies or a small gift and if you are like me and love pretty packing…what could be prettier than a vintage easter egg box! 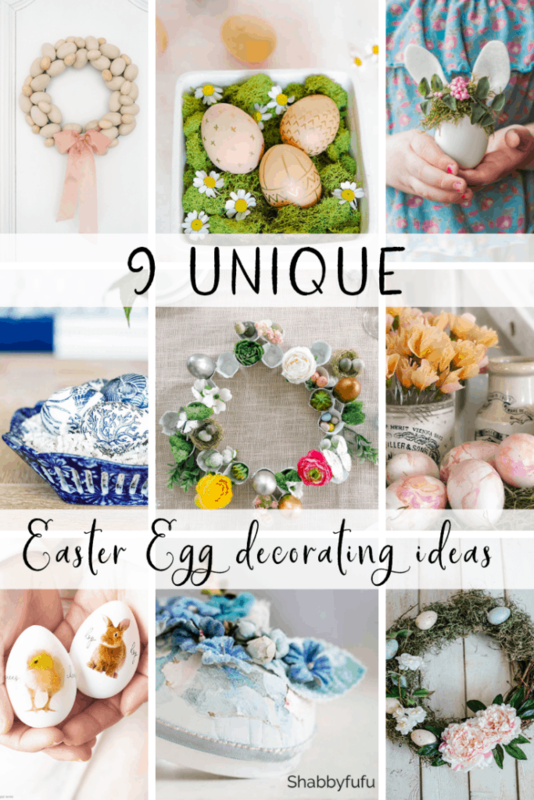 Please visit my friends who are sharing their Easter egg posts below! Girl you've got me jonzing for Spring!! These are gorgeous! I can't wait for Spring to arrive. As much as I love the snow, this year has been a bit much. Janet, these are simply darling! I got some sweet millinery flowers in a recent swap. 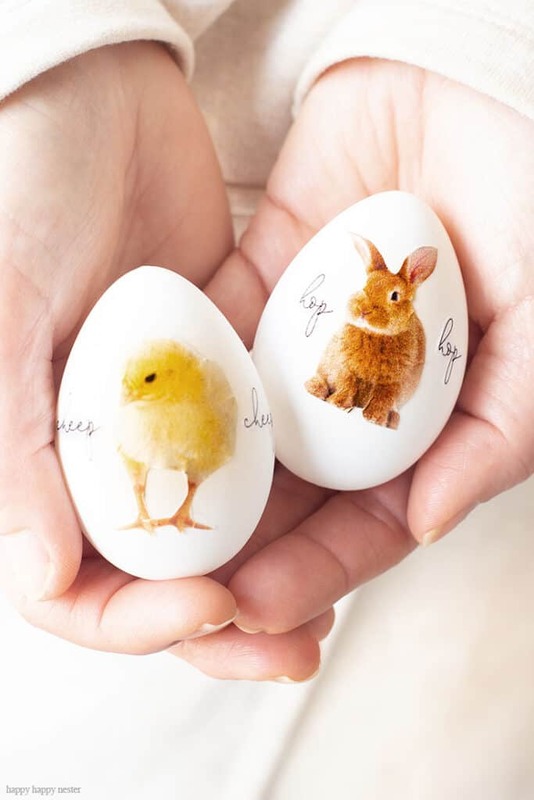 They are dying to go on a cute egg like this! Thanks for sharing. Off to the craft store tomorrow. 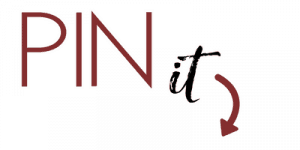 finally catching up on some blogging tonight! lovely! vintage millinery is among my favorite supplies! Love these they are beautiful!! Oh–those are so sweet! I just love them. I don't do enough Easter decorating! 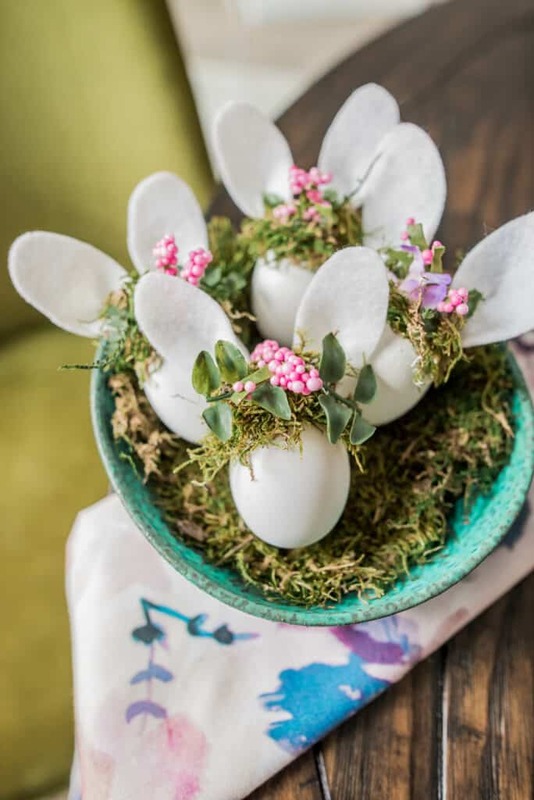 The eggs looks beautiful,I very much love millinery flowers!!! So very elegant; I love the detail. It is time to do eggs! Those eggs are gorgeous. Love them all. I visited before but didnt comment. I love the eggs. I can remember being given a couple as a young girl, such a wonderful, girly present. I think I would rather buy than try to make them. I love how these were inspired by eggs of yesteryear! It makes them even more special. These are stunning my friend! I love the blue velvet flowers! So sweet! Your eggs are so pretty! I love the vintage trim!